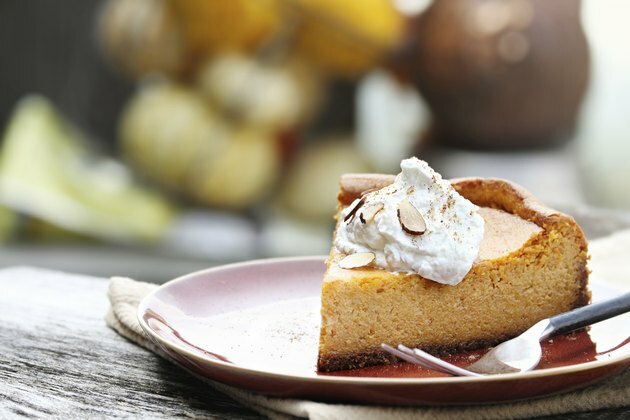 While you might only consume pumpkin during the holidays, it has long had a place in American diets and used to make up a staple in Native Americans' and early colonists' diets. Canned pumpkin allows you to enjoy the health benefits associated with pumpkin flesh without the lengthy process of selecting, baking and pureeing pumpkin. It's low in calories, at 82 calories per cup, but offers lots of nutritional value in the form of fiber, minerals and vitamins. Carbohydrates, in the forms of sugar and starch, make up the majority of the calories in canned pumpkin. Each cup contains 19.8 grams of total carbohydrates, including 8.1 grams of natural sugar and 7.1 grams of fiber. This amount of fiber contributes 28 and 19 percent toward the daily fiber needs for women and men, respectively. It helps keep you full after your meal, lowers cholesterol and prevents constipation. Canned pumpkin also provides a small amount of protein -- 2.7 grams -- and contains less than a gram of fat. Including canned pumpkin in your diet boosts your mineral intake, and it provides significant amounts of magnesium and potassium. Magnesium works to help stabilize the structure of your DNA and cell membranes, and also supports your metabolism by aiding in energy production. The potassium in canned pumpkin maintains healthy heart function and plays a role in nerve transmission. Each 1-cup serving of canned pumpkin offers 56 milligrams of magnesium and 505 milligrams of potassium. This makes up 13 percent of the magnesium requirements for men and 18 percent for women, as well as 11 percent of your daily potassium needs. Canned pumpkin is especially rich in vitamin A -- at 38,129 international units, one serving of canned pumpkin meets your entire vitamin A needs for the day. Your body can use this vitamin A to aid in bone growth, support immune function and maintain sharp vision. Canned pumpkin also provides a significantly amount of vitamin K -- 39.2 micrograms -- which contributes 31 percent toward the daily vitamin K needs for men and 44 percent for women. Getting enough vitamin K in your diet facilitates healthy blood clotting, while low levels cause excessive bleeding. The vitamin A in pumpkin comes from its carotenoid content -- a group of nutrients that your body converts to vitamin A -- which does not pose a risk of vitamin A toxicity. Include pumpkin in healthful baked goods, such as whole-grain muffins or scones. Try adding canned pumpkin to your oatmeal as it cooks, and then garnish your breakfast with chopped pecans and maple syrup for added flavor. Combine canned pumpkin, diced tomatoes, black beans and spices for a healthful pumpkin chilli, or add cooked lean ground turkey for a higher protein option. Canned pumpkin mixed with milk, sage and a dollop of unflavored Greek yogurt also makes for a healthful pasta sauce that has a creamy texture without the fat.